SDET is an IT professional who can work equally effectively in development and testing. Full form of SDET is Software Development Engineer in Test and he/she takes part in the complete software development process. An SDET's professional's knowledge is entirely focused on testability, robustness, and performance. They are also able to play a contributory or reviewer role in the creation of designs for production software. Difference between SDET and Tester? QA is only involved in the testing life cycle of the software development process. Highly skilled professional with development as well as testing knowledge. SDET can participate in test automation tool development and may make it for generic use. Not expected to develop test automation tools or frameworks. SDETs need to perform duties like performance testing, automated generation of test data, etc. Only testing related task will be performed by the tester. No such knowledge expected from QA professionals. When do you need SDET? Today organizations are looking for a professional who can take part in software development. At the same time, he should also handle testing of the developed software. That's why hiring SDET helps them as they can work for developing high-performance code or designing the testing framework. What are the roles and responsibilities of an SDET? SDET should able to perform Test Automation and setting up frameworks on multiple application platforms like Web, Mobile, and Desktop. Investigate customer problems referred by the technical support team. Create & manage bug reports and communicate with the team. Able to build different test scenarios and acceptance tests. SDET needs to handle technical communications with Partners to understand client's systems or APIs. SDET also work with deployments teams and resolving any level issues for the system. SDET should also able to set up, maintain, and operate test automation frameworks. 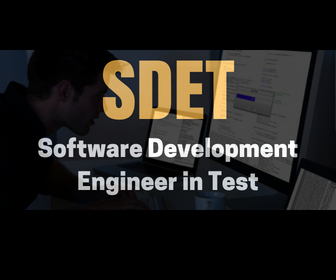 A SDET professional is a mix of developer as well as a tester who has exposure to project management. This all in one type of skill set make the SDET jobs more challenging and highly demanding in the current market.